Back in the eighties my parents had a dessert similar to this at a restaurant and Mama loved it so much she sat there studying it for a bit in order to be able to come home and recreate it for us. It became a fast favorite and has only gotten better with time. Speaking of the eighties, they stalked me the other day when I was walking through the mall. I honestly thought it wasn’t possible to out eighties the eighties, but I guess it took 2010 to do it. Neon is back? Skinny jeans and wildly colored makeup? Fashion has run full circle yet again but I’m still waiting to see if the hair returns. I was really good at eighties hair. Really. I used to tease my wings out and then spray them with aqua net while I stood with my head tilted over in front of an oscillating fan in my bedroom until they dried. It’s a wonder I didn’t fly away with how big those things were. I’ve destroyed most of the photographic evidence but did manage to find this one from my high school graduation and decided to offer it up as a public service message. Look at these two hairstyles and see if you can guess which one is me. I think my high school class is personally responsible for at least ten percent of the ozone’s deterioration. The thing that baffles me is that our kids have seen these photos and yet they still want to revisit this era of fashion um…uniqueness. While I’m not a big fan of the resurgence of eighties style, I will tell you that this flashback recipe from our family in that decade is still as big a hit today as it was back then and it is still a favorite of my brothers. 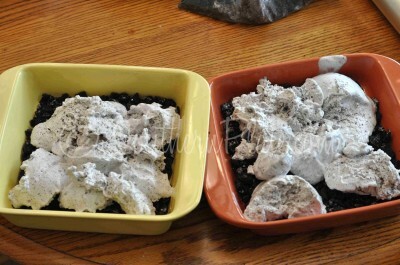 Mama usually makes it on Halloween and calls it “dirt cake” but it is good year round. 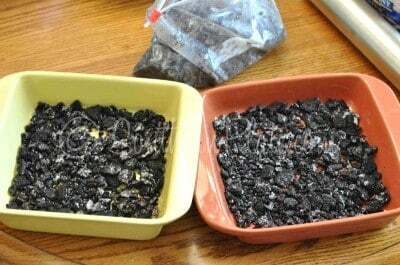 Be sure to check at the bottom of this post for another Halloween tradition we had growing up that is inexpensive, easy, and fun. This recipe can make a 9×13 inch pan full but if that is a bit much for your family, why not make 2 8×8 pans and give one to someone as a gift? So many of us get wrapped up and busy that we forget what a kind and loving gesture a gift of food can be. You’ll need: Cookies and Cream Ice Cream, Caramel Topping, and Oreo’s or a generic version. You can also use vanilla ice cream and crush some Oreos up in it like we used to have to do before they invented the cookies and cream kind. 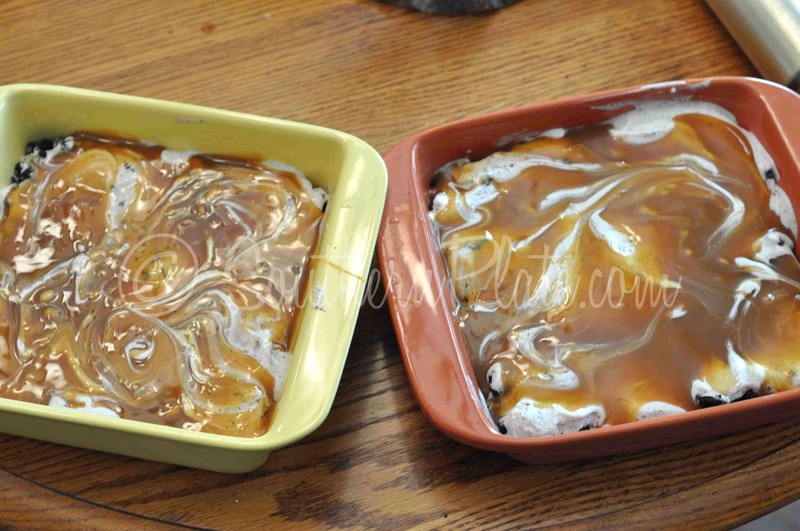 Feel free to use any caramel topping, whatever kind cranks yer tractor. Ain’t nobody gonna judge here on Southern Plate because that’s not how we work. Crush the cookies however way strikes your fancy. This is another one of those golden opportunities that cooking yields to work out any anger issues. If you are making a 9×13, put half your cookies in the bottom of it. If you are making two 8×8’s, put 1/4 of your cookies in the bottom of each pan. Soften your ice cream a bit and divide it among your pans. Spread that around a bit. 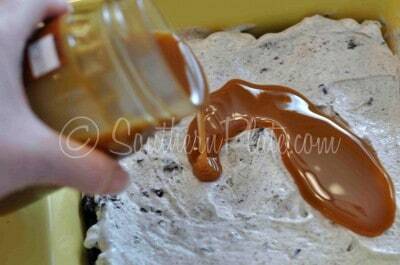 Pour your caramel sauce over the ice cream in each pan. Spread that around some, too. 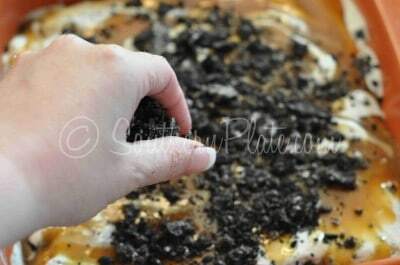 Sprinkle the rest of your cookie crumbs over the top. Now cover it with foil, wrap it really well, and place in the freezer for a few hours. Place cookies in a gallon zipper bag and crush them. Line the bottom of a 9x13 pan or two 8x8 pans with half the cookie crumbs. Spread the softened ice cream over the top. Top with caramel topping and then remaining cookie crumbs. Wrap well with foil and freeze for several hours before serving. This is the meal Mama always made on Halloween when we were kids. Jack-o-burgers, ghost fingers (french fries), and blood (ketchup). 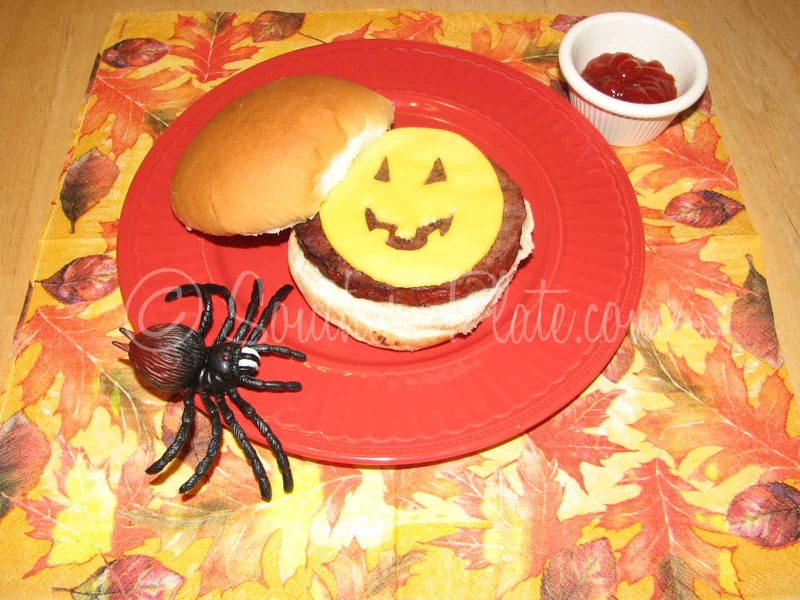 To make the Jack-O-Burger, just use regular old slice cheese and cut a few triangles out for eyes and then the mouth you like. If you are making them for folks who don’t like a lot of cheese, just use the cut out pieces to make a face on their burger (this is what Mama always did for me). If you enjoyed this post, I’d love to hear back from you below. Your comments make this a conversation! What was your favorite eighties fashion fad? 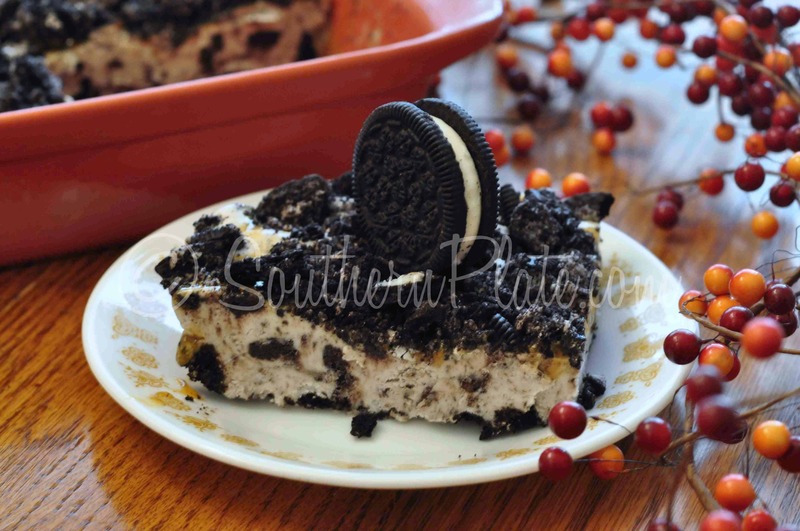 My eldest just saw this post on FB (yes she’s a fan of yours also) and shouted from her room, “Mom, we gotta make this Oreo Cake.” I was on FB also or I would have thought she was crazy. So I hopped on over to check out your recipe. Looks and sounds heavenly. We are BIG Oreo lovers here at the Sharp house. Thanks!! Oh, and I LOVED the quote…might just make it my FB status. Hope your having a blast today! That is so sweet!!! Oh my goodness, please tell him thank you from me! I love quotes, if you ever see one you like, please do share and make it your own! I wasn’t good at ’80s hair even though I lived through it! Maybe it was because I couldn’t stand the smell of hairspray. My mother nagged me to get perms often so my hair would be bigger, but even so, I didn’t have the big poufy bangs that a lot of girls had then! I had one perm in the late ’80s that was really disastrous and that was the end of it for me! Flat hair ever since! That ice cream cake looks pretty decadent! Christy, you haven’t changed since the ’80’s, except for the hair, ha, but I still think your hair looked good! love the stainless steel rolling pin and the cake looks yummy! I hope you’re having a blast in Texas! 🙂 We love ya! My husband would love this cake! I can’t wait to make it for him! My favorite 80s fashion was the peplum dress! It was famous in the late 30s/early 40s too and I really hope it comes back. It gives the appearance of the hourglass figure on just about anyone! I loved 80’s hair, my hasn’t looked right since then. I think I will have to try this recipe to go along with our halloween dinner this Sunday, we are having either Spiderweb soup or Shipwreck stew, goblin juice (grape juice served in skeleton cups). Plus whatever else crazy sounded item I can think up for my teenagers. Thank you Christy!!!! My husband will be in Oreo Heaven!!!!! Oh Christy!! 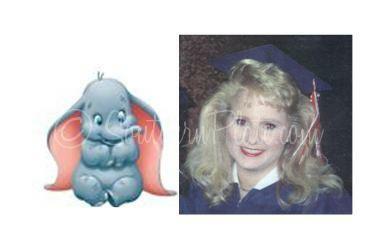 Your graduation photo looks exactly like mine!!! I was class of 85 so you HAVE to be close!!! I too was really good at 80s hair. Wish I knew about your oscilating fan tip! I can remember vividly in college getting up to hot roll my hair every day before heading out to class. Unthinkable now!! Amazing how the 80s fashion is coming back…..wonder if I still have my shoulder pads hidden away somewhere……could probably just substitute my son’s football pads!! Sonya – I agree although the fashion scares me I totally love bringing back the 80s music!! Bon Jovi, Def Leppard, INXS!! OK – feel the urge to go crank up some good tunes now!! Just received your cookbook for my birthday from the ladies that I work with. I can’t wait to start cooking some new and exciting recipes. 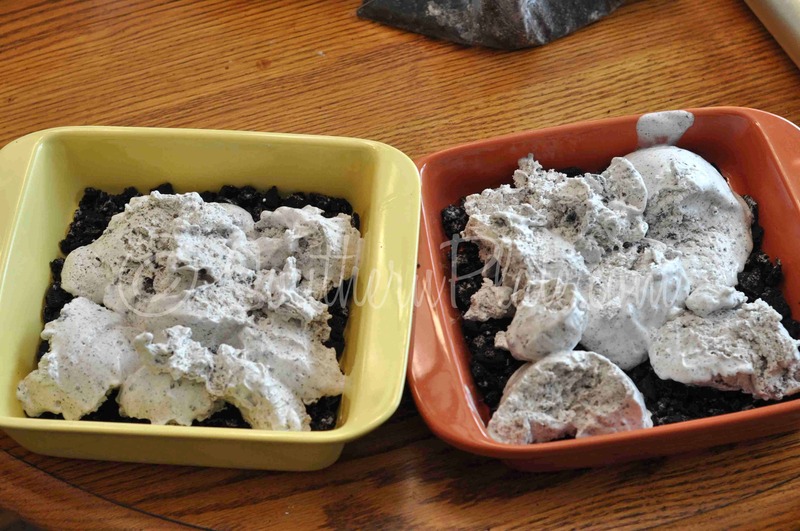 The oreo cake reminds me of what my family makes: Dirt pudding. 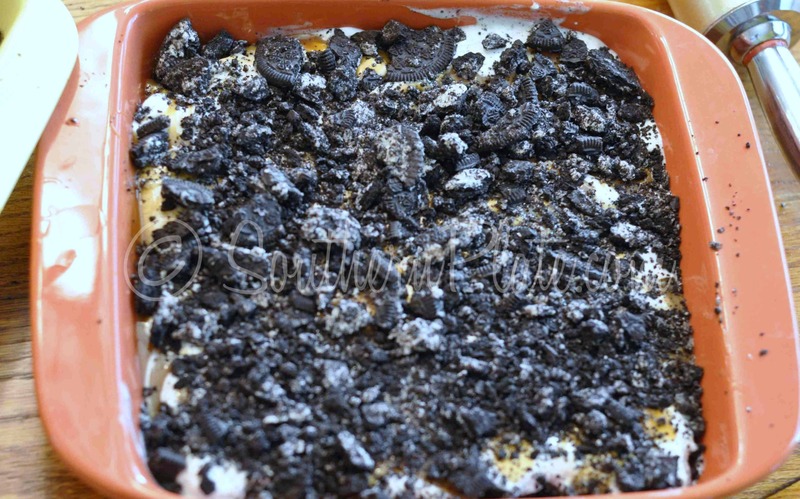 We mix french vanilla pudding with cream cheese and cool whip, mix in half the crushed oreos and put in your serving bowl and layer the rest of the oreos on top. Yum yum yum. Just had that last night (and this morning – but don’t tell)!! We used the Holloween Oreos for a little extra holiday spirit. Yum-o! Ooh, ooh…you could use Pecan Sandies instead of oreos!! That would be delicious!! Good morning, Christy! 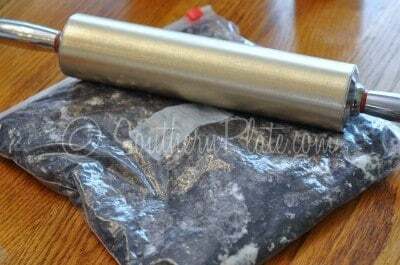 Now you’ve started rolling pin envy! Shame on you! I sat down to check email while sipping *your* BANARITA SMOOTHIE for breakfast and lo’ and behold, this post came in. (I’m addicted to this smoothie recipe, thanks to you. Since I use Splenda, surely it can’t be too bad for me! Southern Plate readers, if you haven’t tried Christy’s recipe for this smoothie, you don’t know what you’re missing!) Anyway, I just thought I’d take a minute to tell you how much you’ve impacted my domestic life. Your cookbook was the last thing I looked through last night before bed (browsing for dinner ideas for today) and as I’ve just explained, I made *your* smoothie for breakfast and now I’m on your blog. 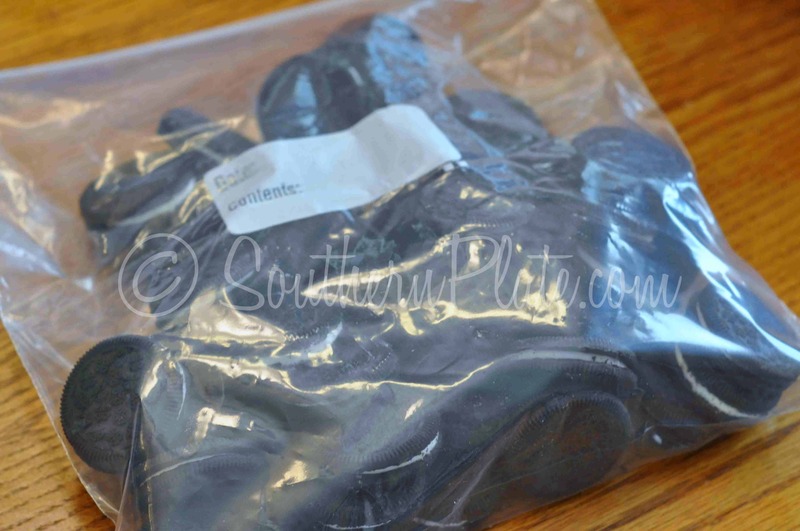 I’m not a creeper, I promise…I just really enjoy Southern Plate so I’m sending a big ol’ Birmingham THANK YOU! I bought a second cook book two days ago…I’m giving it as a birthday gift to a friend in Atlanta. She’ll get hooked on you, too…I just KNOW it! The Oreo Pie looks amazing! I LOVE 80’s hair, 80’s music, and I even miss goofy 80’s sitcoms! (Could do without the neon colors though – they only look good on traffic signs.) Did anyone ever pull their hair out over their ears, spray the fool out of it, and then use a hair dryer to keep it in place so you would have those side swoop things?? Gosh, the lengths we went to for beauty! Southern women were born to have “Big Hair”! Oh, Christy………..funny you brought up the big hair thing. I was looking at my yearbook (1991 grad) with my 14 y/o over the weekend. My what big hair we had!! I cannot wait to get home and make your ice cream cake. As my children would say……you’re the bomb dot com! I was so exicited to see this! Years ago, Chili’s restaurants had THE best oreo cake but then it disappeared off their menu! I had no idea it might be so easy to make!!! 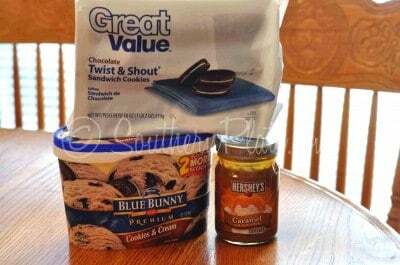 I’m adding these 3 ingredients to my grocery list! Thanks, Christy!! How sweet of your mom to make Jack-O-Burgers…..I remember my Mama making me pancakes in the shape of kitty cats. Those are the little things that you really remember once you’re all grown up. Honey, your hair is flat compared to what my daughter use to wear!!! I promise we measured it once and her bangs were 6 inches high!!!! and the wind didn’t even knock it down, it just swayed alittle!!!!! We always it was so stiff if we bent it , it would break! 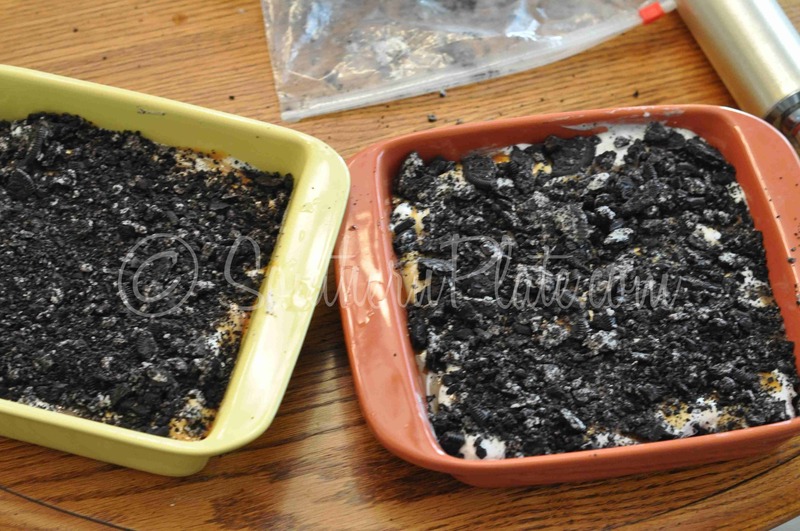 My husband makes a similar recipe to this using the oreo pie crust. PS. You are in my local newspaper today. Press Register, Mobile, AL Congrats! You have a great article in the birmingham News today! Can’t wait for you to come to Birmingham! This recipe sounds yummy! I’ll have to try it this week-end. I’m laughing. 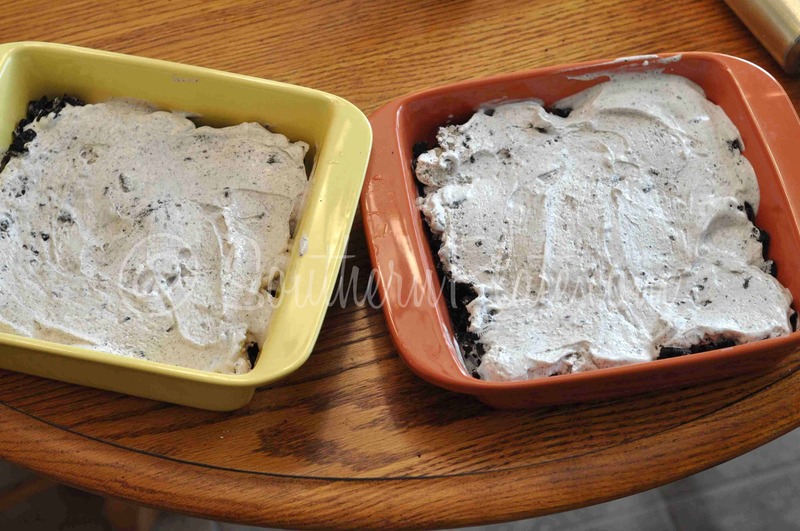 At our house when we say, “Oreo cake” we all remember the time a 3 year old granddaughter’s birthday cake was cooling on the counter. she reached up and over and grabbed one or two fistfuls out of the center to snack on. We just filled the hole with Oreos from the sack and iced right over it. They softened and the cake looked and tasted great. Good work around! Thanks for this reminder of something so good! That’s precious. I love those kinds of memories. This looks great. I am thinking it will be a nice treat for my Spook night movie marathon. Crush cookies in blender. Using a clean flower pot, put a layer of dirt (cookies) in bottom of flower pot. Combine butter, whipped topping, cream cheese, and powdered sugar. Layer over dirt. Combine pudding, milk and vanilla; blend until thickened. Add layer over the first two mixtures. Continue to alternate layers, reserve dirt for top layer. Can decorate with gummy bears, gummy worms or silk flowers. Refrigerate. Use small trowel for serving. Put in small one-serving dish or cup. Decorate and use for place cards and then for desserts. I wore my 80’s hair almost into the 2000’s. My daughter was born in 88. Looking back at her pics, she said, “Mama, why did you always pouf my hair?” Lol. I love your blog and am waiting for the day when I get your cookbook. It will probably be on my Christmas wish list. Wish I could afford to get all my friends and family one, too. LOL Sherian, I just made my version of Dirt cake for my youngest son’s 33 birthday–yes 33 and he still wanted this dessert! I used chocolate pudding instead of vanilla and added his favorite caramel topping in between the layers. I gave it to him in a cool little “guy” tool holder (lined it with plastic wrap) and had gummy worms peeking through the top. He LOVED it!